Bass & Reiner is pleased to present Doppia, an exhibition of new works by Laura Figa and Ellie Hunter. 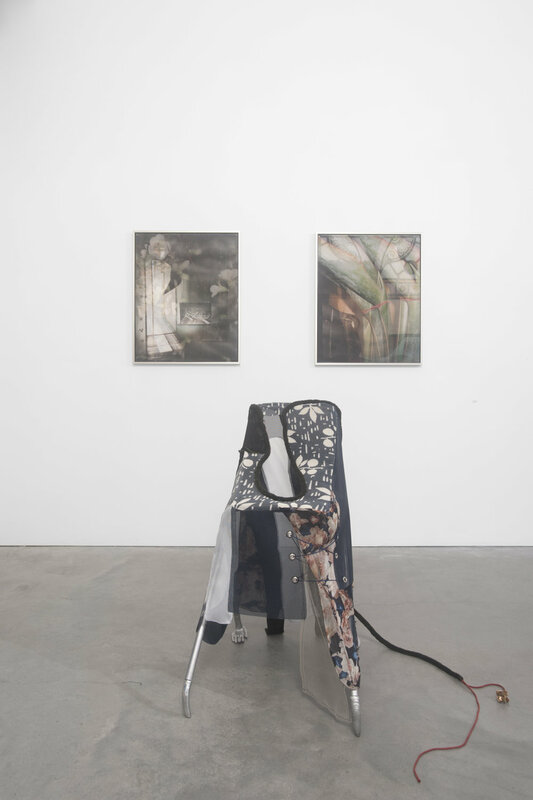 Comprising a series of graphite drawings, sculptures, and unconventional photographic assemblages, the works in the show address the fixing/amplifying of human capacity and the issues inherent in the strategies deployed for these purposes. Laura Figa (b.1992, Chicago, IL.) lives and works in San Francisco. Across a variety of mediums her work explores systems of notation and long distance communication, often as they relate to a human scale. Figa received her MFA from California College of the Arts. Her work has been exhibited at the 500 Capp St. Foundation, San Francisco, CA; Borderline Art Collective, San Francisco, CA; and Johalla Projects, Chicago, IL. Ellie Hunter (b.1989, San Francisco, CA.) is currently based in New York City. An interdisciplinary artist, she locates her work inside spaces where human bodies are heavily scrutinized, and explores the way a pathologizing ethic extends outside of medical institutions and into everyday lives, rendering people as perpetual patients. Hunter received her MFA from Virginia Commonwealth University. She has participated in residencies at Interstate Projects, New York, NY; Rupert, Vilnius, Lithuania; and Ox-Bow, Saugatuck, Michigan. Recent projects include solo shows at Editorial, Vilnius, Lithuania; and SUPERDEALS, Brussels, Belgium; as well as an illustrated short story, Princess, that was released with Publication Studio SF. Hunter is the co-founder of The Sunroom, a gallery and publishing platform currently based between Richmond, VA and New York, NY.